It’s a painful truth that smartphone users drop their phones quite regularly. 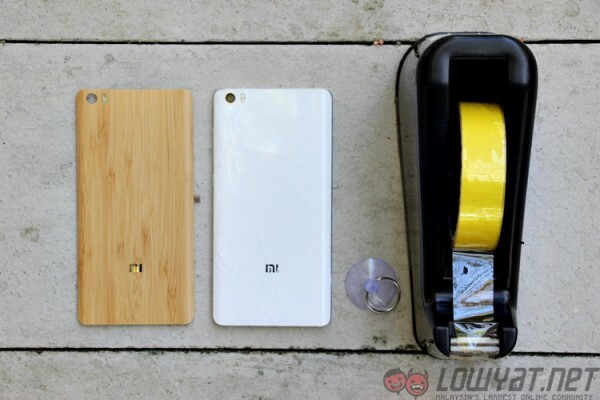 According to a recent Otterbox research, 68% of Malaysian smartphone users would rather live with a cracked screen than spend money fixing it. 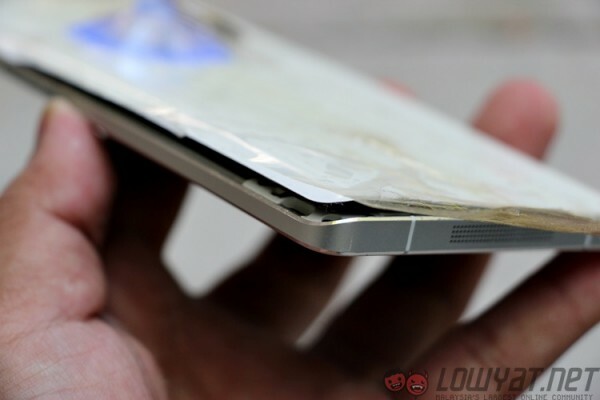 Owning a smartphone with a glass back cover requires requires twice the amount of care and maintenance, but what happens when the unspeakable happens? 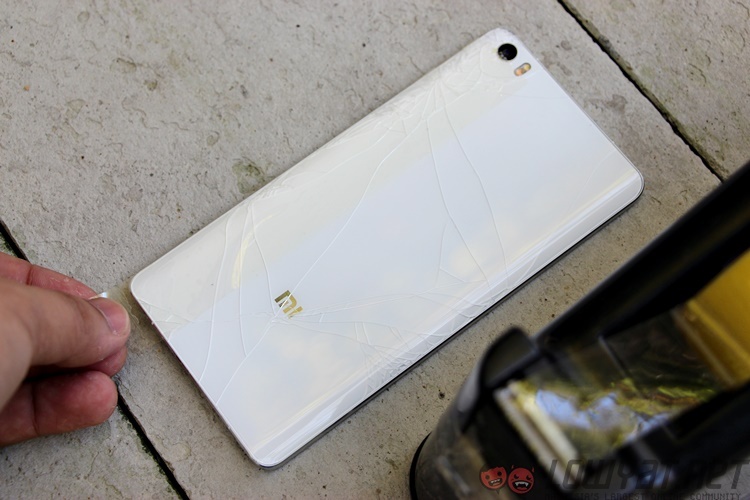 Using a smartphone with a cracked glass back cover isn’t something you should do to save a few Ringgit. Not only can it hurt your hands, it could leave small fragments in places you put your phone: your pocket, your bag, and it might hurt those around you as well. These tiny shards can and will harm you if you’re not careful. Last week, the Mi Note made a cameo appearance in our review of the Mi In-Ear Headphones Pro, and many questioned what model it was. 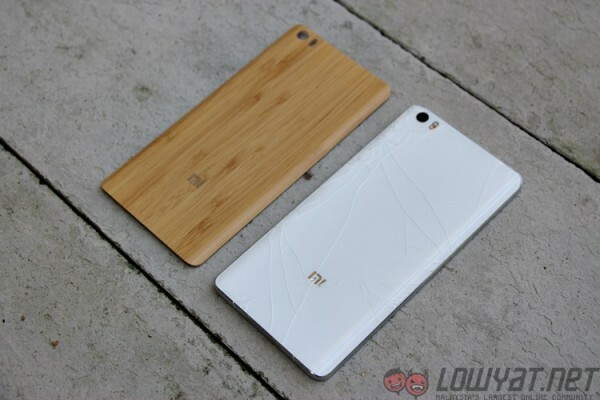 While it was obvious that it is indeed a Mi Note, we actually installed a bamboo back cover on the phone, replacing the original glass one. 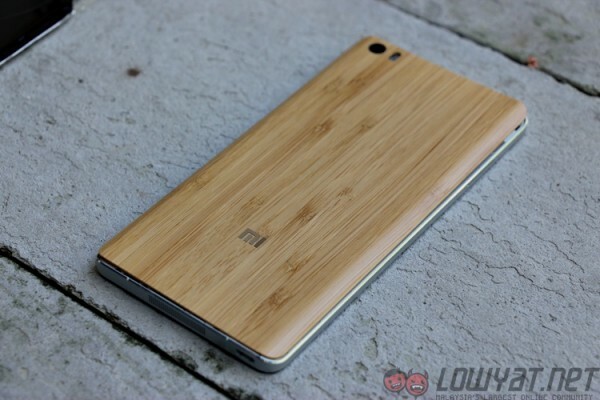 What happened to the original glass back cover on the Mi Note? We’d love to say that it was because we wanted a unique-looking Mi Note, but long story short, its owner has become a part of Otterbox’s research statistic. 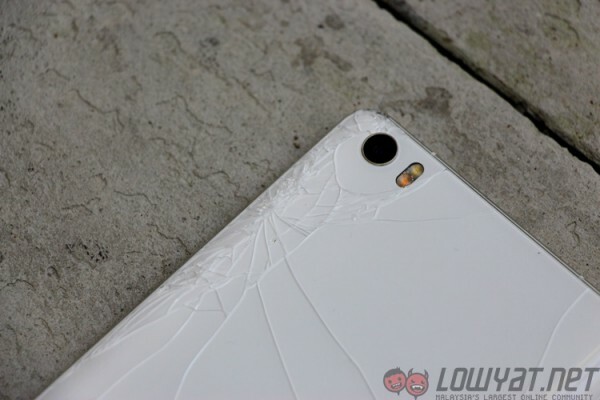 Although the cracked glass pattern looked quite artsy, it was time the back cover got changed for the sake of the phone, and the user’s own good. As it turns out, changing the back cover of the Mi Note is actually quite simple. 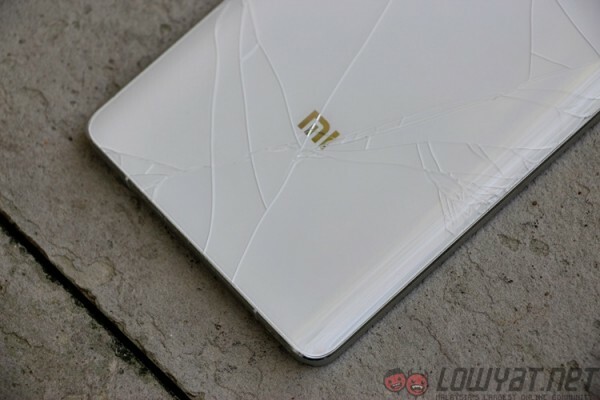 If a similar fate falls upon your own Mi Note, we’ve prepared a simple guide to do it yourself. That said, before you go looking at Xiaomi Malaysia’s website searching for bamboo back covers for the Mi Note, do note (heh) that Xiaomi does not actually offer the back cover as an option – you can buy a Bamboo Edition Mi Note from China, though. 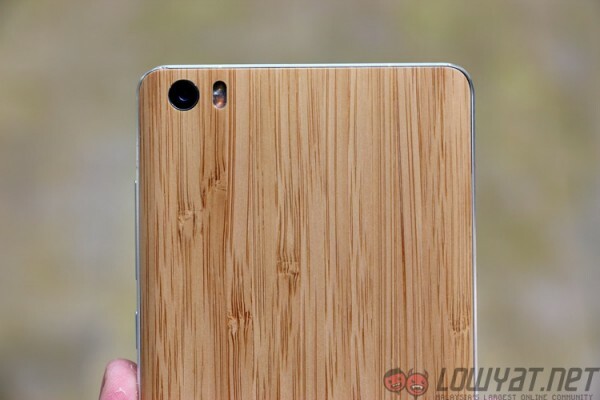 Of course, that didn’t stop us from attaining a (similar looking) bamboo back replacement cover from Taobao (good thing I read Chinese) for a mere RM25 – it even came with a free suction cup. Now that you have your materials ready, let’s get started. 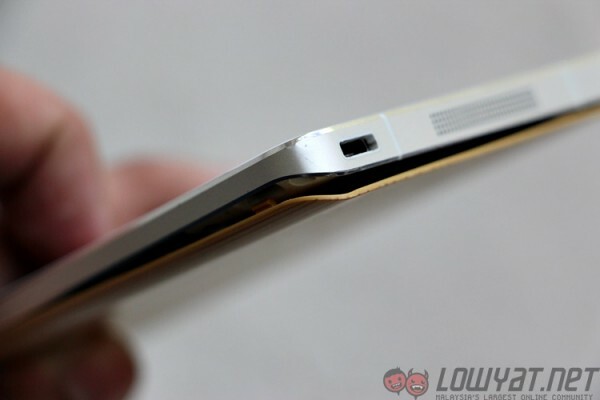 First, power off the Mi Note then gently blow the shattered back of the device. 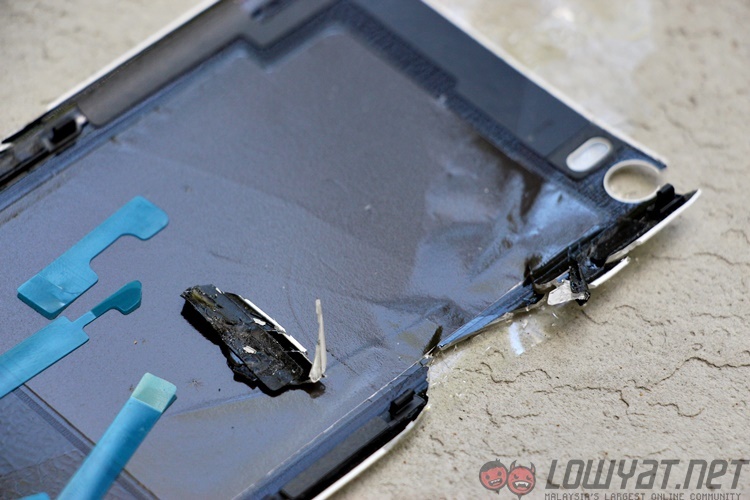 This is to remove any unwanted shards of glass or dust on the surface. Next, take a few strips of cellophane tape and stick them on the back of cracked glass Mi Note. It’s best to line each strip over the other so that it’s easier to pull off the entire back cover in one piece. Once you have the shattered back cover secured with cellophane tape, take the suction cup and place it right in the middle of the device. Press it down firmly and make sure it sticks properly. 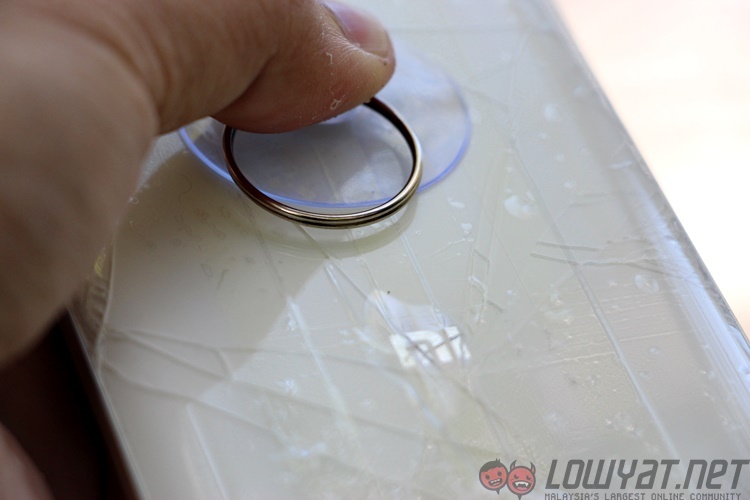 If it doesn’t, apply a few drops of water to the sticking surface of the suction cup. This should increase its suction power. Now that you have the suction cup in place, use one hand to firmly grasp both sides of the phone and use the other to grab the other end of the suction cup – and pull. 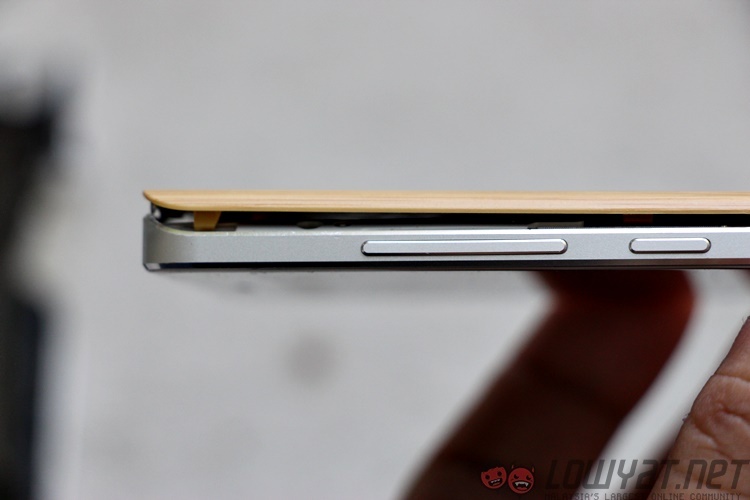 Some might be able to do it in one try, others would need a few more pulls, depending on how severe the cracks are at the back. 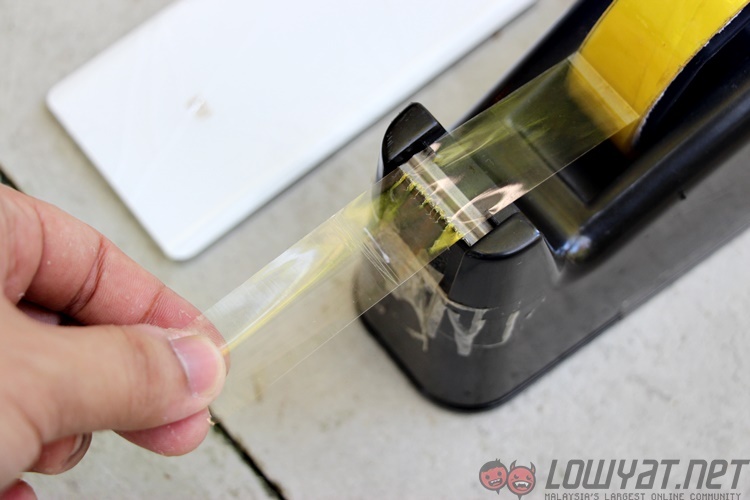 Carefully use the suction cup and work your way around the edges to pull out the back cover. 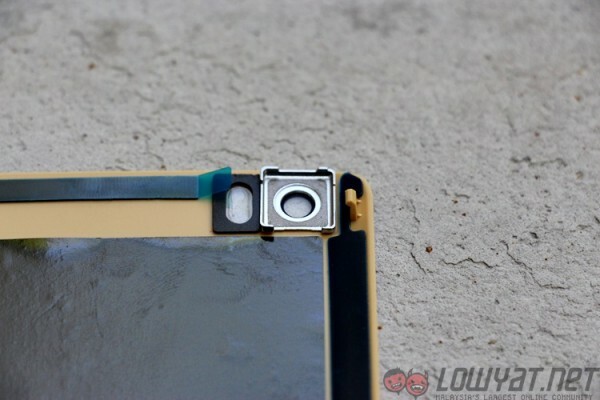 Once the glass back cover is removed, take a look at the camera region of the back casing. 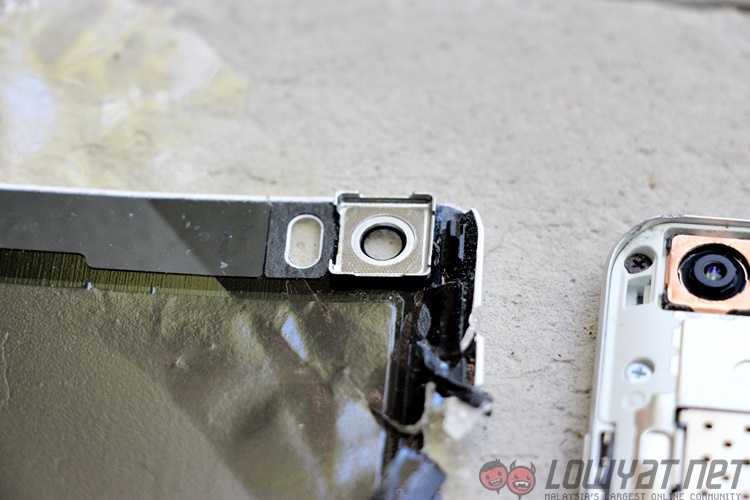 You’ll see that there is a piece of lens that protects the camera. Remember exactly how it is positioned, then transfer it over to the new cover so that you can properly put the cover in place. Then, take the replacement cover and remove all the adhesive protective tape found on the inside of the cover (it’s usually blue in colour). 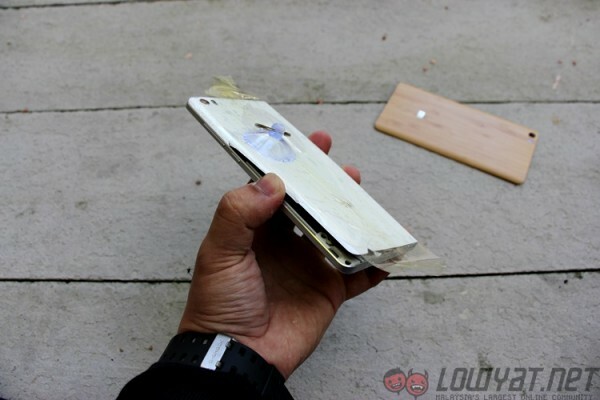 After they’re all peeled off, hold the replacement cover on the sides and line them properly with the back of the phone. 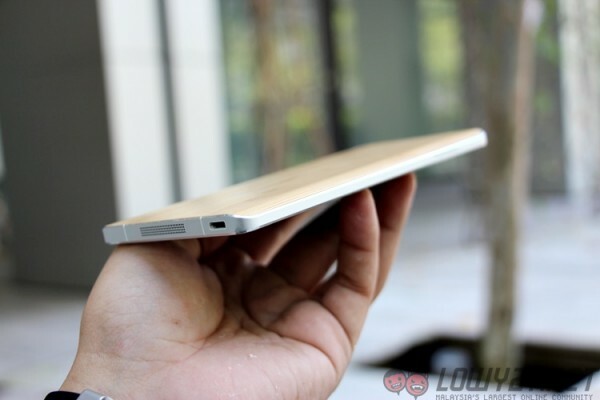 Place it slowly and once you are sure it is in place, firmly press the cover down. 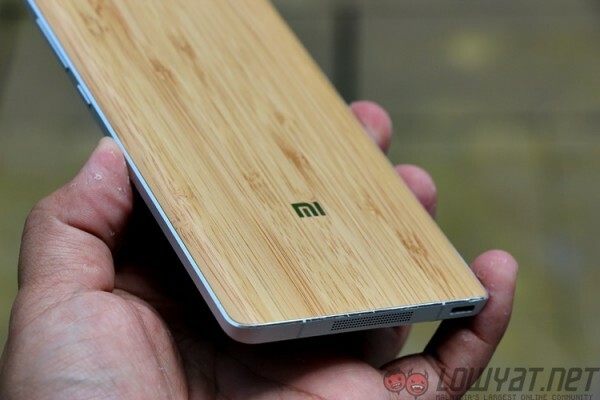 You’ll hear the “clicking” sound as the cover is secured onto the back of the Mi Note. Finally, make sure all sides of the case are firmly in place before safely disposing the old back cover (best in the recycle bins for glass). And… you’re done! 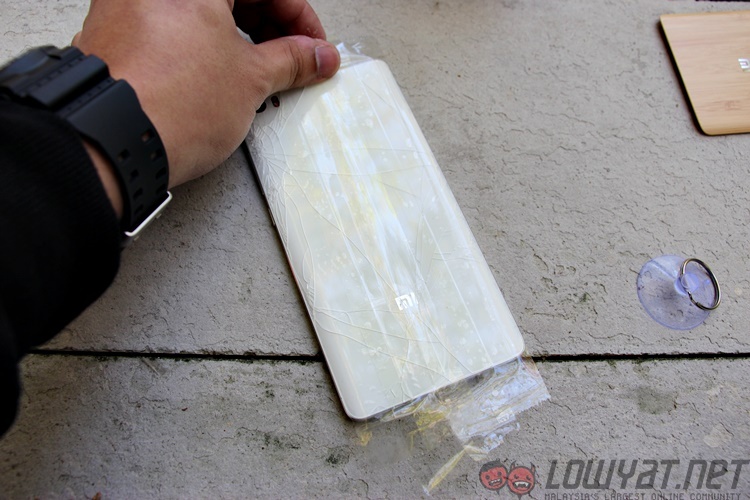 Always remember to be careful when handling cracked glass, and take your time replacing the back cover of the Mi Note. 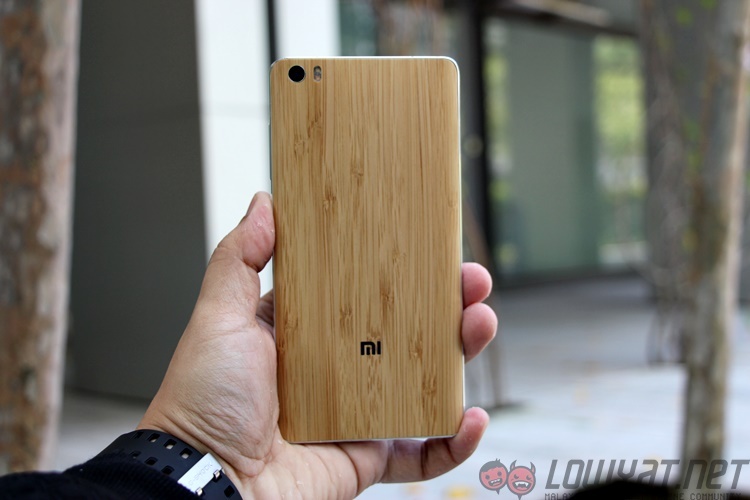 RM25 and roughly ten minutes of your time is all it takes to make your Mi Note stand out from the rest. 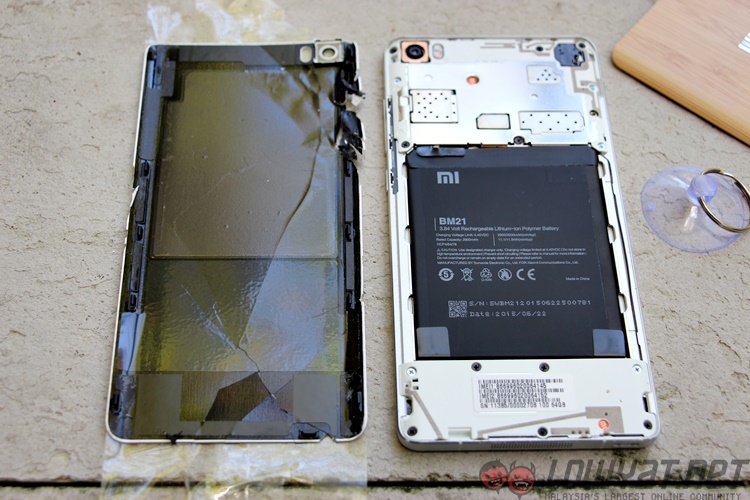 This guide might be written specifically for the Xiaomi Mi Note, but if your phone has a glass back cover (and others have successfully managed to take it apart), you can apply this to your smartphone as well. Plus, there’s no feeling more gratifying than having a good ol’ DIY session with your smartphone on a Sunday afternoon, right?